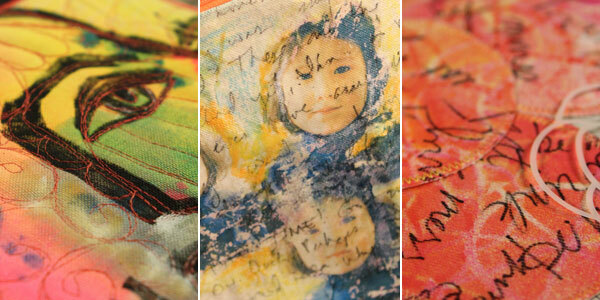 Discover the best stitching segments from Series 100 of The Mixed-Media Workshop. Dyeing to Dye: Use dye in mixed-media sewn and felted projects, including dyeing buttons. Canvas Your Studio: Discover all the ways canvas can be used in your stitched mixed-media work. Iron it on with Vinyl: Iron-on vinyl is perfect for protecting projects and much more. How to felt a Sweater: Learn how to use thrift store sweaters in felted and stitched projects. Journal Quilt: Combine journaling and quilting to create an innovative journal quilt. Free-motion Faces: Use your sewing machine as a drawing tool to create stitched faces. Our Houses: Jenn and Julie duel to see who can create the best stitched house-themed project. Order or download your copy of Season 100: Best of Mixed-Media Stitch today!